I’m always on the hunt for delicious veggie burger recipes. 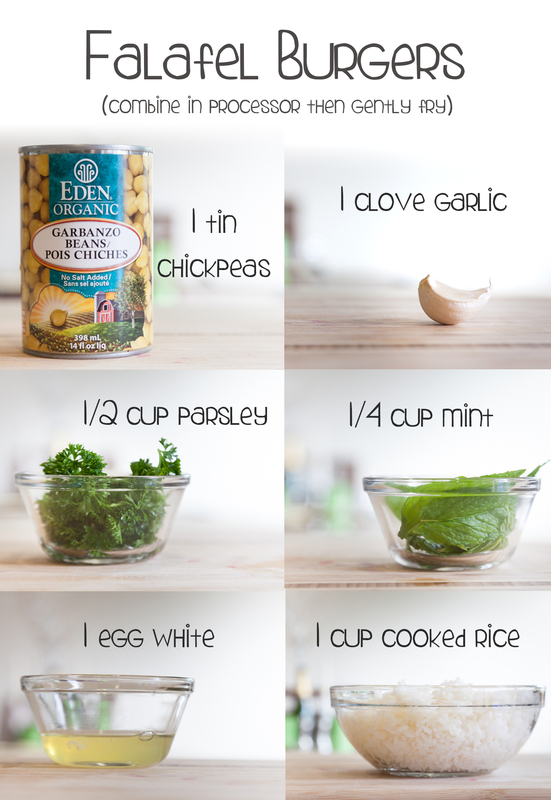 They’re always super easy and full of whole foods, plus they taste soo good. So last night I decided to make some tasty falafel inspired burgers and I went all out and made some rosemary garlic pita breads to stuff them into. They went so quickly I didn’t have time to photograph the finished product 🙂 Always a good sign. My favourite thing about this recipe has to be the fresh parsley and mint – I’m a fan of fresh herbs and I really think they make all the difference. You could totally substitute though if need be. 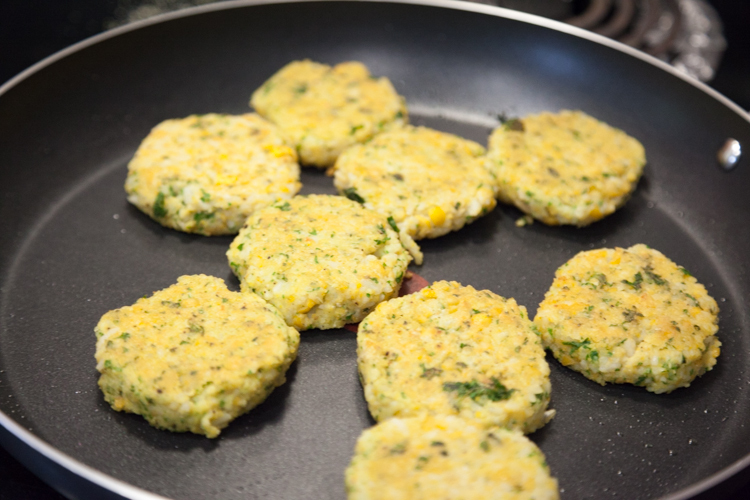 You could also sub out the rice – I wonder what these would be like with cous cous or quinoa? The recipes are included below.. don’t be put off by the many steps it takes to make pita bread, it’s so much easier then you would think! To add to the basic pita recipe below (borrowed from the fabulous kitchn blog), I just threw in some minced garlic and rosemary while kneading. Worked like a charm! 1. Add all your ingredients to a food processor or blender (you could even just mash it up with a fork). 2. 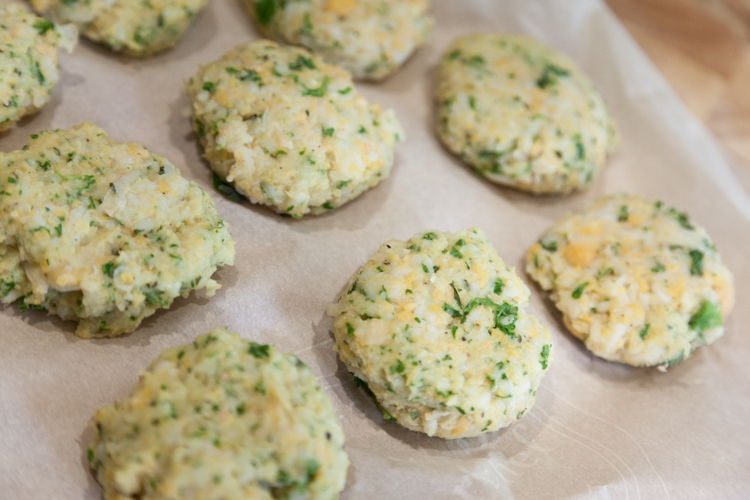 Once you’ve got a smoothish (lumps are OK) mixture, form into patties and place on wax/parchment paper and place in the fridge to firm up for about 20 minutes. 3. Gently heat some olive oil in a pan and once it’s hot, add the burgers. 4. Fry until they are golden on each side (about 5/6 minutes per side). 5. Serve either in a bun, pita or on their own! 1. Form the Pita Dough: Mix the water and yeast together, and let sit for about five minutes until the yeast is dissolved. Add 2 1/2 cups of the flour (saving the last half cup for kneading), salt, and olive oil (if using). Stir until a shaggy dough is formed. 2. 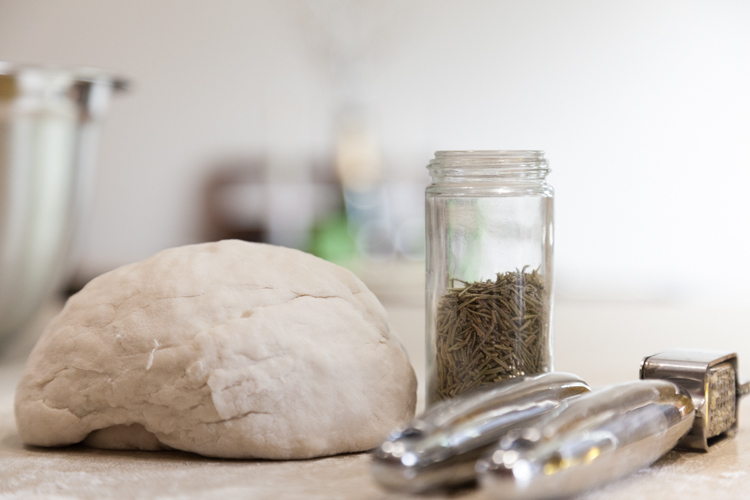 Knead the Dough: Sprinkle a little of the extra flour onto your clean work surface and turn out the dough. Knead the dough for about 5-7 minutes, until the dough is smooth and elastic. Add more flour as needed to keep the dough from sticking to your hands or the work surface, but try to be sparing. It’s better to use too little flour than too much. If you get tired, stop and let the dough rest for a few minutes before finishing kneading. 3. Let the Dough Rise: Clean the bowl you used to mix the dough and film it with a little olive oil. Set the dough in the bowl and turn it until it’s coated with oil. Cover with a clean dishcloth or plastic wrap and let the dough rise until it’s doubled in bulk, 1-2 hours. At this point, you can refrigerate the pita dough until it is needed. You can also bake one or two pitas at a time, saving the rest of the dough in the fridge. The dough will keep refrigerated for about a week. 4. Divide the Pitas: Gently deflate the dough and turn it out onto a lightly floured work surface. Divide the dough into 8 equal pieces and gently flatten each piece into a thick disk. Sprinkle the pieces with a little more flour and then cover them with a kitchen towel or plastic wrap wrap until you’re ready to bake them. 6. To Bake Pitas in the Oven: While shaping the pitas, heat the oven to 450°. If you have a baking stone, put it in the oven to heat. If you don’t have a baking stone, place a large baking sheet on the middle rack to heat. Place the rolled-out pitas directly on the baking stone or baking sheets (as many as will fit), and bake for about 3 minutes. I’ve found it easiest to carry the pita flat on the palm of my hand and then flip it over onto the baking stone. The pita will start to puff up after a minute or two and is done when it has fully ballooned. Cover baked pitas with a clean dishtowel while cooking any remaining pitas. 7. To Bake Pitas on the Stovetop: Warm a cast iron skillet over medium-high heat until a few bead of water sizzle immediately on contact. Drizzle a little oil in the pan and wipe off the excess. Lay a rolled-out pita on the skillet and bake for 30 seconds, until you see bubbles starting to form. Flip and cook for 1-2 minutes on the other side, until large toasted spots appear on the underside. Flip again and cook another 1-2 minutes to toast the other side. The pita should start to puff up during this time; if it doesn’t or if only small pockets form, try pressing the surface of the pita gently with a clean towel. Keep cooked pitas covered with a clean dishtowel while cooking any remaining pitas. 8. Storing the Pitas: Pitas are best when eaten immediately after cooking. Leftover pitas will keep in an airtight bag for several days and can be eaten as they are or warmed in a toaster oven. Baked pitas can also be frozen with wax paper between the layers for up to three months.